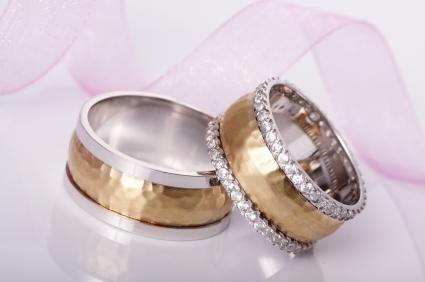 Article Highlight: How Should a Wedding Ring Fit? At their finest, wedding rings symbolize the promise to love without end. Choose a ring you'll want to keep for the rest of your life. There are many style options and different considerations for both brides and grooms when it comes to selecting this meaningful item of jewelry. This LoveToKnow category offers information on a range of aspects when choosing rings to symbolize your marital commitment, including metal, style choice, inclusion of gems in the bands, and unique or specialty rings to help you make the right selection. Yellow and white gold are very traditional choices for a wedding band, but there are other options that are also quite beautiful. Rose gold is exceptionally lovely, either by itself or in combination with yellow and white gold. If you're looking for something a little less traditional, take a look at tungsten bands. Silver bands also make a nice choice, but keep in mind that silver is softer than gold and tungsten so it's easy to scratch. If you appreciate durability, stainless steel bands might be a better choice. If style is your main consideration, there are many articles to browse that relate to specific looks. Maybe you're looking for a ring that expresses your cultural heritage, like an Irish wedding ring or Native American wedding band. A vintage ring style might appeal to you, or you may consider getting a simple wide-band ring. If you'd like your wedding band to include a gem, make sure choose one you really love. White diamonds seem to be the most popular choice by far, but perhaps you'd prefer something a little different like chocolate diamonds. If diamonds aren't your favorite, don't be afraid to venture off the beaten path. Consider a pearl ring or maybe even a beautiful amethyst or turquoise band. If you're more of a free spirit, there are plenty of unusual wedding rings to choose from. Styles include themes like Goth bands, horseshoe rings, dragon bands and even dolphin rings. Cost: Cost can be an important factor, and this category has articles to help you find the one right for your budget, whether it's an inexpensive band or a designer style. Engraving: Engraving is a popular way to personalize wedding bands -- get engraving ideas for the perfect touch. Wearing: Find out the best way to wear your ring, and which kind of ring will work best for your lifestyle. Ring guards: Learn whether this protective ring style will work for you. Matching rings: Decide whether you and your partner want to invest in matching or similar ring styles. With so many points to consider, it may seem like you have a difficult choice ahead of you. Relax and have fun finding out more information about the different kinds of rings that are available. The easy-to-browse articles and helpful information in this category about different types of rings will help you make the right choice. By being informed, your ring can be a perfect symbol of your perfect love.